Replace the Humanitarian Fund section of the Budget & Assessments Agreement with the following. We maintain a Humanitarian Fund. The purpose the Fund is to provide money to members in financial need. Money comes into the Fund through voluntary private donations. • Distributions are only available to Heartwood members. • Distributions are given only for financial hardship to meet basic needs, such as shelter, utilities, HOA assessments, common meals, medical costs, food, clothing, transportation to work, etc. In determining the amount of the distribution, the Steering team exercises its discretion, taking into consideration such factors as the severity of the hardship, the long term financial strength of the Fund, etc. In any 12 month period, a household may receive distributions totaling a maximum of 50% of the Fund balance at the beginning of that 12 month period. The Steering team provides an easy method(s) for members to request a Fund distribution. All requests and distributions are kept confidential to the extent reasonably possible. A member seeking a distribution may represent himself or herself to the Steering team or may use a representative. It is not OK for someone to seek a distribution for another member without that member’s consent. The Finance team provides homeowners with an easy opportunity to donate to the Fund when paying HOA assessments. The team is also responsible for making collections and distributions. At the end of each year, the HOA adds a portion of its overall investment income to the Fund based on the average Fund balance for the year in proportion to all HOA investment balances (or subtracts from the Fund in the event of overall investment losses). It is estimated that this will generate a 12 month total of approximately $70,620. 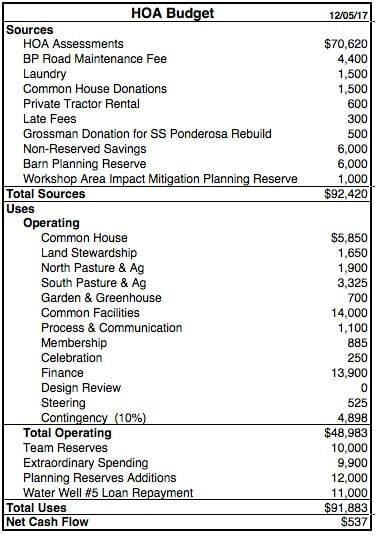 Consistent with the Operating section of the Budget spreadsheet dated 12/05/17 (above), the total 2018 Operating Uses budget will be $48,983. Specific team Operating budgets are detailed in the spreadsheet. Teams are authorized to spend their Operating budgets as they decide consistent with their responsibilities listed in our Teams agreement. C2 Spending authorization is effective immediately and ends on December 31, 2018, unless otherwise noted. C3 Extraordinary Spending is to be consistent with the Extraordinary Spending Request submitted and this proposal. C4 The HOA will spend up to $300 to build new outdoor raised beds at the Greenhouse. Any additional money raised by the G&G team through private donations will also be used for the new outdoor raised beds. C5 Spending authorization for LST - Rebuild SS Ponderosa and LST - Replace Village Green Pathway (approved as part of the 2017 HOA budget) ends on December 31, 2019. Annual funding for the CFT - Water Tank Interior Coating Planning Reserve will increase from $1000 per year to $3000 per year. Annual funding of $3000 will continue until the balance of that Planning Reserve reaches $32,000. Annual contribution to Team Reserves will be $10,000 per year starting in 2018 (was $8000). This is in addition to operating profits that automatically get added to Team Reserves at yearend. We will pay back $11,000 of the Water Well #5 Loan. CFT is authorized to hire community members who have been adequately trained to plow snow at a rate of $30 per hour. Money to pay for snow plowing will come from the Team Reserve for CFT - Snow Plowing. The Planning Reserves of $6000 for Barn and $1000 for Workshop Area Impact Mitigation will be retired. The money will be used to fund the 2018 HOA budget. $6000 of Non-Reserved Savings will be used to fund the 2018 HOA budget.